Even though it seems like the middle of February, it is actually the end of April–and that means finals–and that means GRADING! But you don’t have to grade alone. Instead, you can join your colleagues for a night of pizza, motivational prizes, and good company as you dig into those final tests and essays. 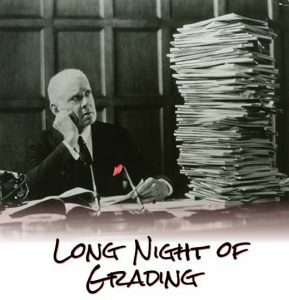 Join CIE, EMT and the Osterlin Library for The Long Night of Grading on Thursday, May 3 from 6-10 pm in the Osterlin Library. We can’t promise that this will make that final grading any easier, but we can guarantee it will make it more fun! See you there!